The overdue end of the most notorious terrorist in human history was always a priority in defending the security of America since 2001, but as long as Obama remains in the White House, the liberal establishment will exploit every circumstance to defend their pernicious political moorings and Obama's fraudulent usurpation of power. So the question is now, what, over the past 10 years since America became the first nation in human history to proactively engage a global war on terrorism, has this now deceased, cave-dwelling goatmate ever really accomplished? Notoriousness. Murder. The death of a man bearing such diminished value to humanity is of no significance to the righteousness which ended his foul existence. Of course, he is dead. What did you expect? On the other hand, however, Barack Obama is alive, right now! His lie continues. In the last three years, this man has wreaked havoc throughout the political, social and economic spectrum of American culture as no one ever has before. Obama would tell any lie to keep his power while concealing the facts about his covert biography from the American people. There is no behavior too excessive for this administration, which is driven by liberal psychosis to realize a globalist delusion while hiding their hypogaeum of deception and hatred for vintage American heritage. Even the death of a terrorist, like Osama Bin Laden, is well within the parameters of exploitable circumstances. Though it bears unspeakable admiration for the American military and for the previous administration for establishing operations in the region 10 years ago, the timing of Bin Laden’s demise in a Pakistani compound is highly retrospective when weighed against recent events surrounding Obama’s ineligibility to be President. The long overdue end of the most notorious terrorist in human history is now being exploited by the Obama administration as a political ploy to distract the American people from Obama’s increasingly apparent illegitimacy as president while he, himself, even attempts to take credit for the decade of hard work and sacrifice which had been undertaken by heroes on the ground in the Middle east long before he ever became a candidate for federal office. Let’s make sure we give credit where credit is due. This is a victory for those who lost loved ones because of this murdering, hate-filled animal on 9-11, primarily, and for those who have sacrificed their blood and lives in this decade-long war on terror, and for the valiant missionists who have continued to engage against evil where evil lives with unwavering bravery and beautifully orchestrated, righteous violence. Now, let’s get back to the most important business at hand, without which security for the American people could not exist; The Constitutional sovereignty of the American people and the current domestic threat against it residing in the White House. Prior to the carefully calculated diversion of the killing of Osama Bin Laden by military forces built on the actionable intelligence and strategy originally deployed to the middle east during the Bush administration, the liberal media, along with Obama himself, lauded the release of a copied “Certificate of Live Birth” which was allegedly issued in scanned form by the Hawaiian Health Department on April 27th, 2011 and has since been found to have highly suspicious digital alterations and inconsistencies within it. Though merely a document image, it was endowed by the White House staff, without verified sources, who said it proved Obama was born in Hawaii, intentionally ignoring the fact that the document image was in a long-form format deployed by the very same municipal agency which previously issued another format of other so-called “official” birth certificate images in Hawaii known as a short-form “Certification of Live Birth”. Recall, the liberal media has, while casting accusations of racism upon anyone who questions it, dishonestly declared the "Certification of Live Birth" the only valid form of birth documentation issued by the State of Hawaii. That document, first released in October, 2008, was also in a digital image form which was shown to be altered and then, later, photographed in its paper form revealing it contained no original signatures or stamps to validate it. Moreover, the document explicitly proves that Obama is not eligible to be president because it verifies, unequivocally, that Barack Obama’s father, Obama Sr. was named as his biological father and that the Kenyan-born British national was never a citizen of the United States. Astonishingly, the claims about Obama’s plural parentage have never been denied by Obama or his defenders. As a matter of fact, advocates for Obama have brazenly declared with politically-correct, ideologically-driven pride that Obama’s paternal parentage is an indicator of their president’s “diverse heritage worthy of America’s multicultural history”. 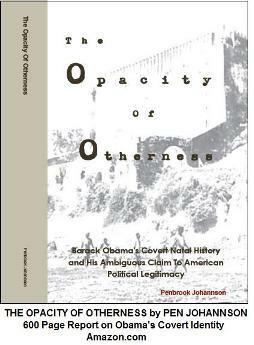 This ultra-left view completely denies the authority that the Constitution explicitly forbids foreign-born, multi-national and political plurality among the biographical metrics of Presidential candidates. The eligibility clause was mandated by our founders, not because of racism, but in order that America’s sovereignty would be preserved by our President’s exclusive allegiance in every way, including politically, militarily, economically, socially and doctrinally, to the United States alone. We should be mindful that our founders were of a generation of revolutionaries who had seen generations of monarchal corruption brought by intermarriage, cross-breeding with enemies, treasonous alliances and indecent liaisons among their government. Their desire for natural-born eligibility was one solution to this generational problem of undermined sovereignty. Astonishingly, as precedence for this judgment against Obama, the U.S. Senate formed a committee, on which Obama himself was a member, which investigated the “natural-born” status of 2008 republican presidential nominee, John McCain. The committee declared and unanimously agreed in a formal and binding Senate Resolution (S.R. 511) that McCain was an eligible presidential candidate under Art. II of the U.S. Constitution because it found that McCain’s birthplace in the Panama Canal Zone was the result of his father being stationed as a U.S. Naval officer there in 1936 and, most importantly, it explicitly declared that McCain was eligible because he had been born to two U.S. citizen parents the resolution declared. The senate refused to form such a committee on behalf of Obama’s eligibility because congressional leaders already know, though they will not publicly or legislatively acknowledge it, that Obama was an ineligible candidate and, now, is an illegitimate president based on the well established facts of his parentage. Whereas, if a U.S. Senatorial committee, of which Obama was an approving member, had explicitly declared by resolution that John McCain’s eligibility was affirmatively proven by the very fact that both of his parents were indeed U.S. citizens, congress, in all of its rank cowardice cannot now reverse the ruling and declare that Obama is eligible by the same standard knowing that his alleged father, as so named in his “official” natal documentation, was not a U.S. citizen. As justice calls upon the world, may Bin Laden’s hell be as a lost, teeth-gnashing soul among the vastness of the blessed Christian kingdom which stretches for eternity all around him, from which there is no escape, while his victims stand in the fullness of restored glorious judgment wherever he attempts to flee from God. May Bin Laden remain in his ever-dying form, suffering the same death of each human being he murdered, forever, in a universe created by the very same God in whose name he claimed justification for slaughtering innocents but Who now holds him in contempt with irreparable, burning disdain. 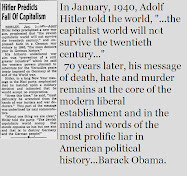 And, may Obama take note of the epic lie which brought Osama's end. For the record: Obama's long form Certificate of Live Birth document is quite clearly based on secondary sources information without any supporting original source documentation from his hospital-issued birth certificate. * In addition, Obama's Certificate of Live Birth document is obviously not a copy of an original record of birth, as he amateurishly tried to project. Such authentic copies would be negative image reproductions of archived photostats. Moreover, the Registrar clearly states as much in his affirmation stamp on Obama’s new long form Certificate of Live Birth document as the following: “I certify this a true copy or abstract of TXE record on file in the Hawaii State Department of Health”. A TXE record is an “enriched text file” used to combine graphics with textual data for easier storage and retrieval of information stored in computer databases. So, the Registrar is certifying that all the information on the new long form is all from electronic sources, which might not even be based on any one particular database record. The Registrar admits none of the data is from original sources; it is all digital data printed out as an “abstract”. In conclusion, Obama has thrown us all another head-fake, and is again laughing at us. He knows nothing can be proven or disproven from his newly published long form Certificate of Live Birth document. He also knows its only function, like the publication of his first Certification of Live Birth document, was to simply fool as many people as possible until election time. *It took Donald Trump all of a week to publish both documents. By the way, this brings up an interesting fact I had forgotten. Do you remember the first time Obama produced his “Certification of Live Birth” document and it didn’t have an embrossed state seal on it and all us “Birthers” raise hell about it? But when the FactCheck people went over to his campaign headquarters, to take pictures of the “real” deal, the embossed seal mystically appeared? Well, I am a notary, and a stenographer, I can tell you sometime around the year 2000, embossing seals went out and ink-stamps came in due to the high volume of faxes being used. In Hawaii, state statue states that a notary can EITHER embossed their seal over their actual hand-written name, or simply use a stamp of the signature’s hand-written name …but not both! Evidently, State Registrar, Alvin T. Onaka Ph.D, didn’t like to actually sign hundreds of documents a month, so he used a stamp — and only a stamp. But, of course, the grunts at Obama’s campaign headquarters didn’t know this. Please email me at jsheldon@socal.rr.com as we need to confer!